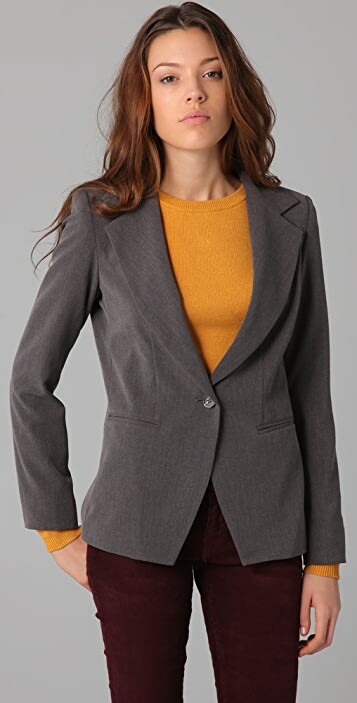 This blazer features a notched collar and single-button closure. Welt hip pockets and padded shoulders. Notched cuffs. Long sleeves. Lined. * Shell: 62% polyester/32% rayon/6% spandex. 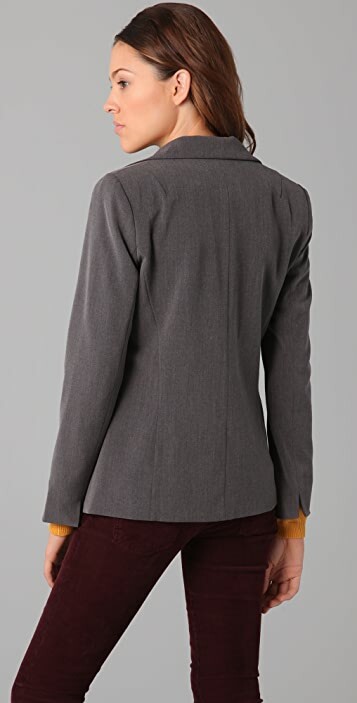 I ordered this jacket along with the Tahari Melissa blazer in my hunt for a red blazer. This one fit nicely and is a true, deep red. However, the fabric is quite thin. It arrived rumpled and, worse, the seam on the left arm was already splitting in one place and looked poised to split in other areas as well. Overall, it just seemed too thin and flimsy for me to feel like I would be able to wear it frequently. The color is a brighter red in real life. Blazer fits well, although I wish the material was a little less flimsy. Bought it in red, and found the cut and color to be completely flattering. The sleeves are a tad long for my 5'4" self, but I usually wear them cuffed and rolled up anyway. So versatile -- can be worn more casually with jeans or dressed up a bit with jewelry and dress pants. Tempted to buy in charcoal as well. Definite value for the price tag. I thought this blazer was so cute in red. Unfortunately it was not as flattering on me as I had hoped. This was in part due to the color and in part due to the cut. It was not as bright of a red as I was expecting (it's not a red-orange at all)/just wasn't the best for my skin tone. As far as the fit, it was a little wide in the shoulders and chest, but I think that is due more to my measurements than the cut of the blazer-- I do have rather narrow shoulders and a small chest. Wish it would have worked for me, as it looks so cute on the model! Average quality of material. 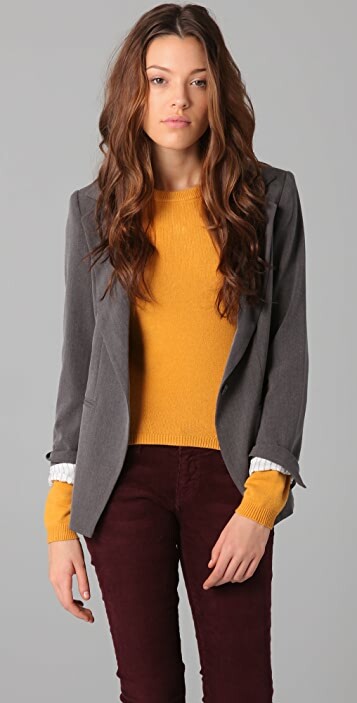 This Blazer is so reasonably priced and perfect for Fall. It fits great and the red color adds an awesome pop to the most basic outfit of jeans, riding boots, and a plain white tee!